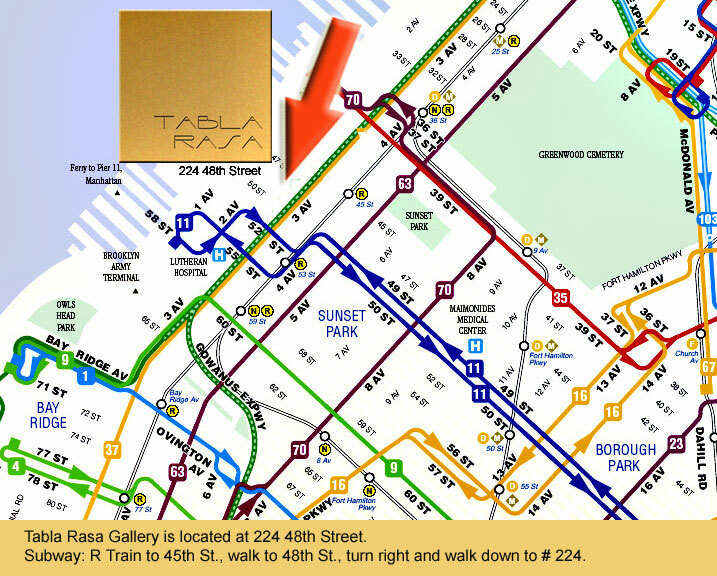 TABLA RASA GALLERY is EASY to reach from Manhattan. We are located just three "N" EXPRESS stops from 14th Street/Union Square to 36th Street or four "D" EXPRESS stops from West 4th Street/Washington Square to 36th Street in Brooklyn, and ONE local "R" train stop to 45th Street. "D" EXPRESS to 36th Street in Brooklyn. Cross platform to "R". One stop to 45th Street station. From NYC - Battery Tunnel, take ramp on the left to 278. Bear right to merge onto 278 W. Exit 23 toward 39 St. Turn left at 2nd Ave. Turn left at 48th St. 224 48th Street will be on the right. Street parking is most plentiful weekdays after 4pm and weekends.